Often, grouts are applied through a hole drilled next to the leak so water pressure forces the material into the crack. 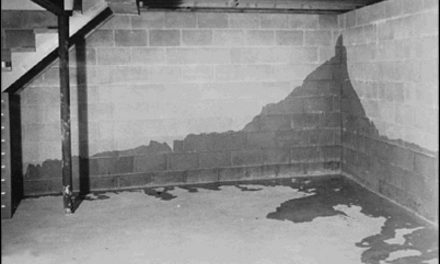 There are many options for repairing leaks in concrete structures. One of the oldest, yet least understood repair methods utilizes polyurethane chemical grouts that react with water. They either bond with the concrete to form watertight, permanent seals or become rigid to fill voids and stabilize the soil. According to the National Association of Sewer Service Companies (NASSCO), chemical grout was first developed in 1955. Since that time, it has been used in sewers, manholes, tanks, vaults, tunnels, and many other applications all over the world. More than 40 years of experience indicates that it’s still the most cost-effective, long-term defense against infiltration of groundwater into structurally sound sewer systems. Our nation’s infrastructure is aging while its population continues to grow. 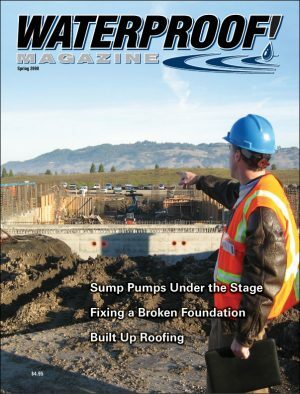 As a result, municipalities and contractors are under constant pressure to find effective repair options to ease treatment plant overburden and to reduce infiltration. Infiltration occurs when defects in sanitary sewer lines, manholes, pump stations, catch basins, and storm drains allow groundwater to enter the system. This infiltration adds to treatment costs and increases the risk of sanitary sewer overflows (SSOs). Groundwater leaks also carry sand, silt, and other debris into the system, increasing wear and tear on equipment. 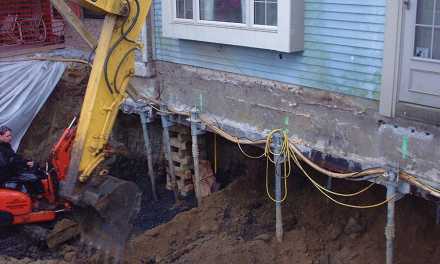 Leaks can also create voids or undermine the structures, leading to an unstable foundation and settlement. Studies show that 40% of groundwater infiltration in sewer systems enters through manholes. Most rehabilitation usually involves a spray, hand-applied, or cured-in-place (CIP) lining system. But groundwater infiltration must be eliminated prior to installing the lining. 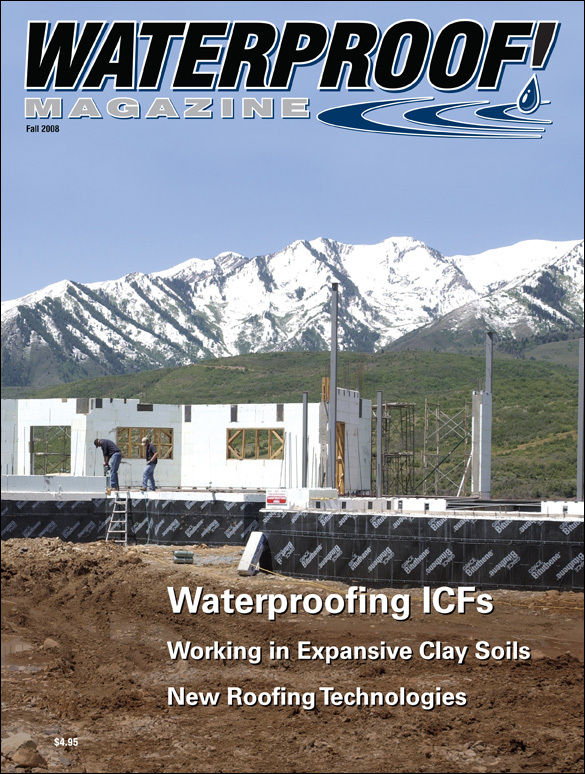 Many contractors use a quick-set hydraulic cement, which stops the leak temporarily, and provides enough time for the lining to be installed. But this type of patch is actually quite temporary, and can lead to a weak bond and failure of the lining system. With polyurathane grout, leaks can be stopped in a matter of seconds, permanently and with immediate cost-savings. Polyurethane chemical grouts are usually sold as liquid resins injected into or around the leak. Once the resin contacts water, a chemical reaction occurs. Depending on the material, it forms an expansive closed cell foam. 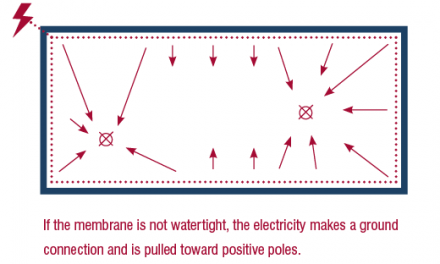 The foam created can be flexible and resilient (hydrophilic) or rigid (hydrophobic). In most manhole leak scenarios, the water flow or leak can be utilized to pull the grout into the structure. To accomplish this, a hole is drilled in the vicinity of the leak and the chemical grout is injected through the wall into the water source. The water pushes the material back into the structure and seals the leak from the outside in, creating a seal through the entire wall. 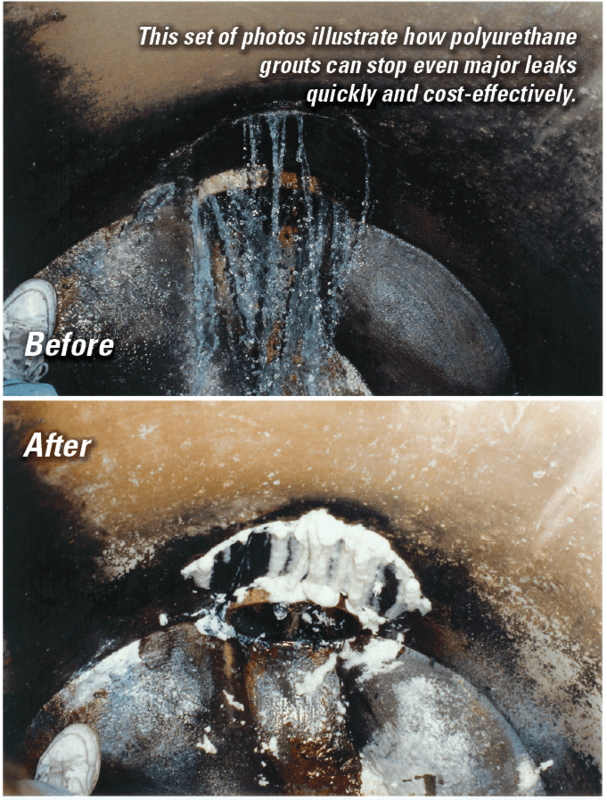 Chemical grouts can also be injected directly into the defect in cases where the leak is not strong enough to pull the chemical grout into the structure. The expansion of the foam helps ensure a complete seal. 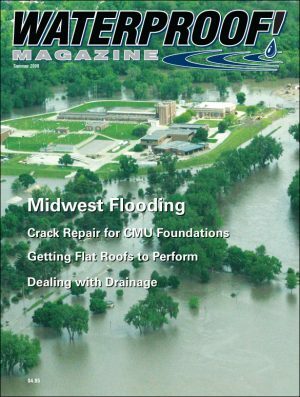 “With any type of repair, choosing the right repair material has a great impact on the longevity of the repair”, says Scott Kelly, technical support specialist for Prime Resins, Inc. “There is not a single product on the market today that is a fix-all, do-all for repairing all leaks in concrete,” he says. “Any products will temporarily fix a leak, but if applied correctly, most polyurethane grouting repairs are permanent,” Kelly added. Knowing the differences in hydrophobic and hydrophilic chemical grouts is a crucial. Hydrophilic Grouts: These products produce a closed cell foam when mixed with water. The reaction time is typically 30 to 45 seconds, and they expand 5 to 8 times in volume. Hydrophilic chemical grout “likes” water and is able to bond to wet surfaces tenaciously; the resin can even work its way into water-filled pores in the concrete. Hydrophilic chemical grouts are flexible and resilient after full cure and will allow movement to occur in the structure without damaging the seal or bond. Hydrophobic Grouts: These require a catalyst, blended into the resin prior to installation. The amount of catalyst controls the reaction time and the volume of foam. Using the maximum dosage of catalyst, (10% by volume), hydrophobic resins have an aggressive expansion—as much as 29 times in volume—and the reaction time is 10-12 seconds. Hydrophobic chemical grouts repel water after activation, but when injected into a wet crack, hydrophobic resins can trap water in the pores of the wet concrete. This trapped water becomes a bond inhibitor. Hydrophobic resins cure rigid and do not recover from compression. If the structure moves there is good chance the cell structure will be damaged and leaks will reappear. Hydrophobic chemical grout is low viscosity and permeates loose and non-consolidated soils readily. If the repair project involves a non-structural defect in concrete or masonry, a hydrophilic chemical grout should probably be used to seal the leak. 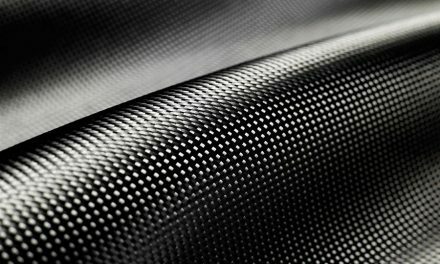 Hydrophilic foams are appropriate for above grade or below grade installation. They are typically 85% air after expansion, and have excellent elongation, compression and rebound for use in expansion joints, cracks, or any other non-structural defect in concrete structures. Use hydrophobic grouts if the job involves a gushing leak that is impractical to repair with hydrophilic resins. In below grade structures, this is a good way to fill voids that may be present outside the structure. Once the leak is reduced to a manageable level, hydrophilic resin should be injected into the defect to back up the hydrophobic material. “Activated Oakum” (dry oakum soaked in hydrophilic resin) can also be used to reduce the flow of gushing leaks. If the leak can be slowed, a hydrophilic resin may be practical to complete the repair. Don’t get in a hurry when repairing tight cracks and minor leaks. These can be the most difficult to repair long term. Avoid installing hydrophobic chemical grouts in these situations. The repair will be temporary. 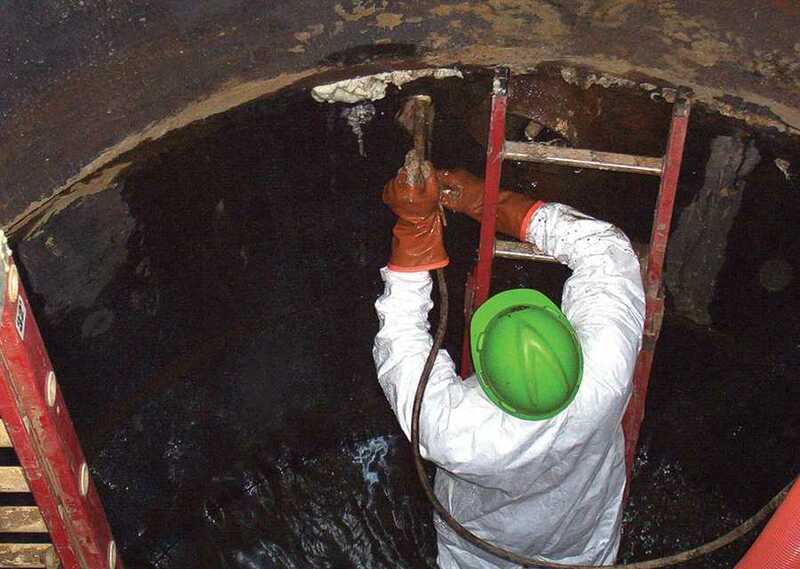 As our infrastructure ages, chemical grouting will continue to maintain its value as one of the easiest, most cost-effective and longest-lasting repair solutions available. 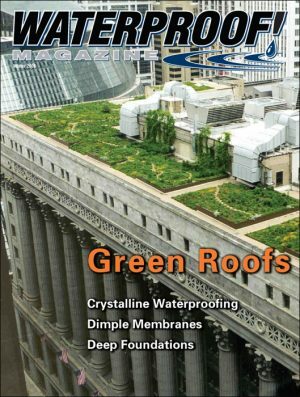 “If the right polyurethane chemical grout is chosen for your repair project and the correct installation techniques are used, the repair will actually outlast the structure,” says Scott Kelly. Scott Kelly and Michelle Robinson are employed by Prime Resins, Inc., a leading manufacturer of polyurethane grouts and epoxies. For more information, call 800-321-7212.